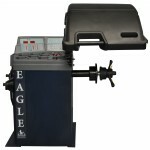 Do you have Eagle Equipment’s EB-1040 or EB-1070 wheel balancer? Does it need to be calibrated? 3. The main reason a balancer needs to be re-calibrated is because it begins to “chase weight”. “Chasing weight” means the balancer continues to ask for more weight once the first weight is applied. At this point, the machine needs to be calibrated. Here, Zach and Andy show you how to calibrate your Eagle EB-1040 and your Eagle EB-1070- it takes only a few minutes to get your balancer back in working order! If you are having trouble, please give us a call at 800-336-2776 with any questions. We are happy to assist you. 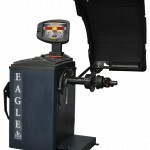 I rented a garage that has your brand wheel balancer EB-1040 and it keeps Chasing weight, i have look for the 100g weight and i can’t find it. how much it wold be to get another one of your calibrate weights. Give us a call…. we’ll be happy to assist. Have you calibrated the machine? Next Next post: FREE LOCAL PICKUP & $50 OFF YOUR ORDER!